Hawaiian home decor is beautiful. It often features tropical wood, shells, and other natural materials. But where do you find those great items of Hawaiian home decor? One great source is the Aloha Home Market in Kailua, Oahu. What is the Aloha Home Market? 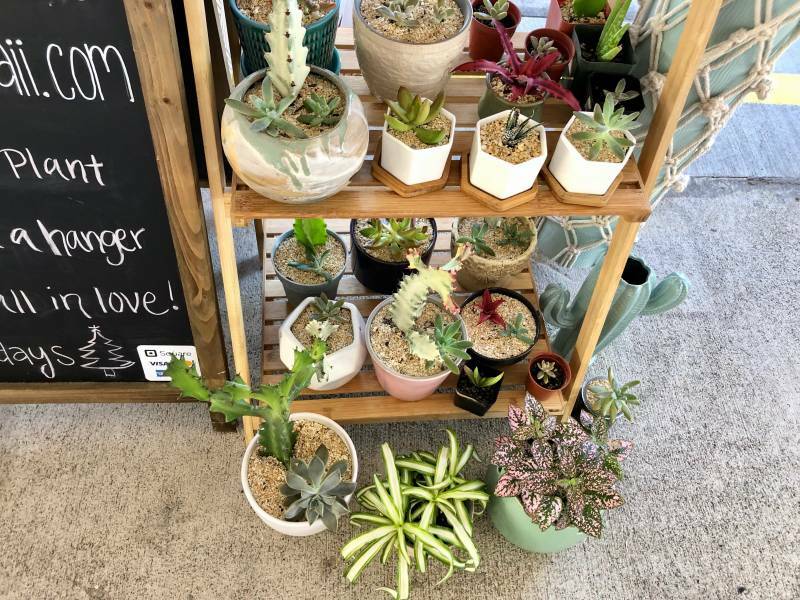 The Aloha Home Market is an outdoor gathering of vendors from all around Oahu. Most specialize in Hawaiian home decor, but there are also vendors with other types of handmade craft items. 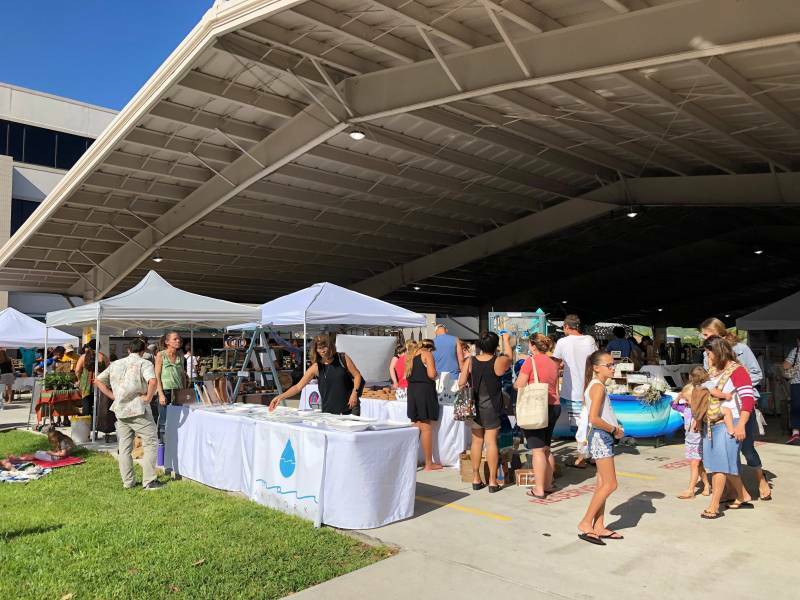 This week, vendors were selling jewelry, decorative items, ceramics, small plants, wall decor, pet items, throw pillows, tables, and rugs and other textiles. In addition, Rocket Coffee is there for your cup of morning Joe. 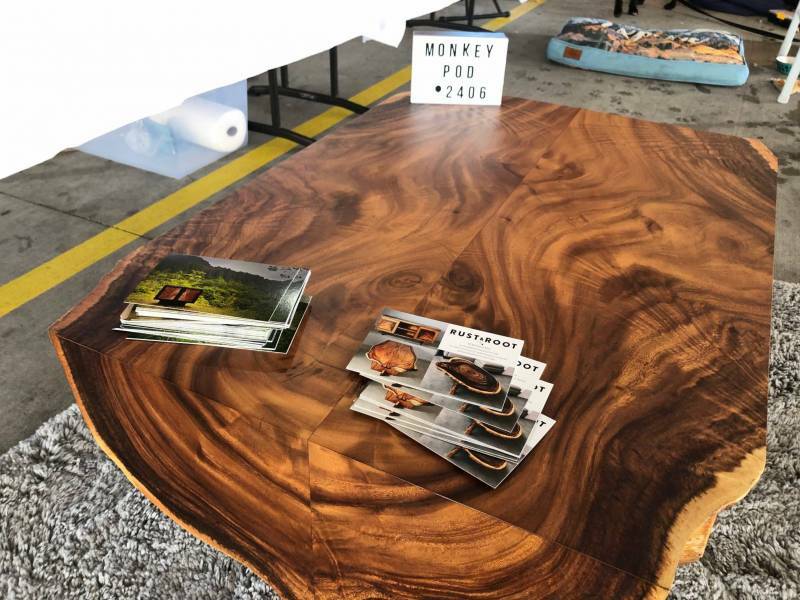 Rust & Root Kailua furniture makers. 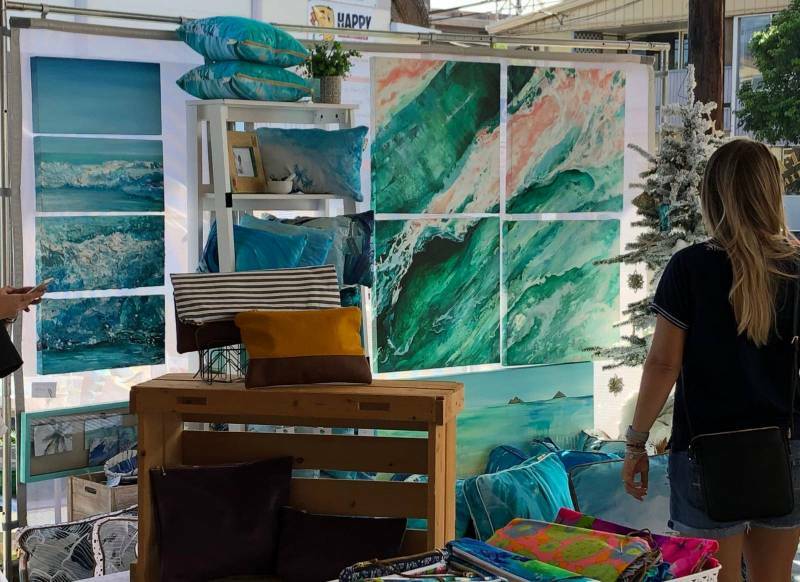 Vendors include: Aloha Aura, Aloha Puppy, Artsy Fartsy Decor, Bee’s Cotton Wrap, Christian Bendo Art, Heartfelt Aloha, Island Bungalow Hawaii, Lovingly Restored By Laura, Lyfted Hammocks, Malia Nakai Designs, Marr Artworks, Matt Okahata, Momo Terrascapes, Rocket Coffee, Rust and Root, Show Pony, and more! It’s fun to browse around and soaking up the artsy and fun vibe. Besides that, you can pick up some great holiday gifts. Cute plants that are sold with macrame hangers. Art and decorative pillows at the Aloha Home Market Kailua, Oahu. The Aloha Home Market occurs periodically, every month or two. The market is typically Sunday morning from around 9am-1pm. Follow on Facebook, to stay advised of the dates. The address is 340 Uluniu Street Kailua, Oahu. Fortunately, the Market is under a covered parking lot, so no worries about the weather! Yvonne Ahearn is a REALTOR-BROKER, ABR, CRS, CLHMS, ILHM Million Dollar Guild, GRI, MRP, with Hawai'i Life. Yvonne Jaramillo Ahearn, Esq. works out of the Honolulu Office, and lives in Kailua, Oahu. Her clients benefit from Yvonne’s in-depth Oahu expertise and negotiating skills. Yvonne has been a REALTOR on Oahu for more than a decade, selling mostly in Kailua and Honolulu, but also covering areas such as Kaneohe, Ewa Beach, Mililani, and North Shore. Many of her clients have relocated from the mainland, have second homes on Oahu, or are military, and a large percentage of her clients are repeat clients and referrals. Yvonne has a passion for architecture, and vintage and historical homes, as well as a personal flair for design. Besides her many contacts in the home remodeling space, she has become known locally for her beautiful home staging projects, which enhance both the sale price and the speed of sale for her listings. Yvonne Ahearn is a 2015, 2011 and 2010 Winner of the Aloha Aina “People’s Choice” Award for the island of Oahu. She and her husband have a delightful son, and are also involved in many of his activities. In her spare time, she is involved in various non-profits and enjoys beautifying her garden full of tropical plants. Please Contact Yvonne at 808-721-8088 or YvonneAhearn@HawaiiLife.com, if you need assistance with Oahu, Hawaii real estate. You can email me at	YvonneAhearn@HawaiiLIfe.com	or via phone at (808) 721-8088.